Charge Shot!!! : I Want YOU To Vote! 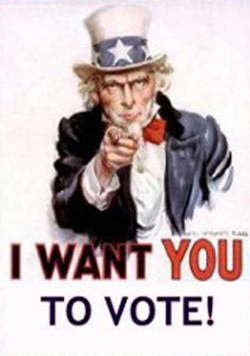 I Want YOU To Vote! I don't really want to call a play before it happens, but something tells me that this weekend is going to be, in the simplest of terms, pretty crazy. The tandem rallies to restore sanity and keep fear alive (hosted by Jon Stewart and Stephen Colbert) promise to be one of the more massive gatherings of politically active young people in a long time. In some ways more significant than the grass roots upheaval by which Obama catapulted his way into the White House, the rallies on Saturday may be the beginning of a new youth movement: A movement that values action and pragmatics over idealism and political polarity (pardon the editorializing). Plus, Sunday is Halloween….historically, that particular event is accompanied by by some fairly raucous partying. Apparently when everybody puts on costumes, eats candy all night and throws down a few too many, they seem to celebrate a bit excessively. As we recover from the hangover of our patriotic and costumed excesses, as well as being marred once again by our apparent collective complacency, we are in danger of missing a vital opportunity to actually embrace our patriotism - to go out on Tuesday and vote. Case in point, eating dinner a few nights ago with some friends, during a lull in the conversation, I asked one of my buddies where his voting location was. He dismissed the question, admitting that he hadn't really looked into it. As I urged him to dramatically change his attitude, I realized politically complacent and removed young voters might not consider this election a priority. In fact, as young voters (sorry to be over inclusive), this election is particularly important. We indeed have the most at stake and must make our voices heard. In addition to the House and Senate races, there are dozens of important governorships in play, not to mention initiatives and propositions in several states (read more here). So, go out and vote. Also, get your friends and family to vote too. Through all of the craziness of the political season (which feels like it never ends these days), we have to remember that the election day ballot box is the only poll that ever matters.